My children and I started a compost pile a couple of years ago, as one way of recycling and improving the health of our garden. 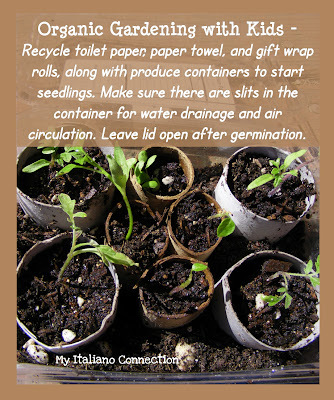 However, there is more than one way to use recycle household "trash" in the garden. Enter toilet paper, paper towel, and gift wrap rolls. In the past we put them in our blue recycling bin. Then we thought we had done a little more to nurture our earth by tearing them up into small pieces and throwing them into our compost pile. But how about a money saver and earth-friendly use of these items in the garden? We cut them into the size of small seedling pots, filled them with our homemade potting soil mixture, and then add our heirloom seeds. But wait, it gets better. You know those plastic containers your produce comes in? Strawberries, blueberries, mix salad greens, etc? Most of the time they have plenty of venting in the bottom and top, but if not, we add some slits. They become a miniature DIY greenhouse, which increases our germination rates. Once our seeds germinate, we live the lid open. By placing the seeds in the cut up tubes, they are much easier to remove from our miniature greenhouses without the soil crumbling away from the roots and no damage to the stems. We stick the entire thing in the new pot or ground and we are good to go. The cardboard tubes breakdown in the soil and become compost. We recycle more than this in our garden, but I will save that for another day!